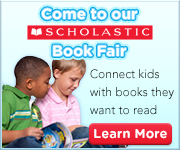 Come into the project room above the gymnasium during book fair hours or visit our online book fair. Help us build our school resources by fulfilling our classroom wish list created by our teachers and your elementary students. Invite your family’s Grand-relatives and friends to a special Grand Event to enjoy coffee, tea, bagels and muffins while they browse the book fair.